Spieth heads into the first round in pole position to claim the US$10-million bonus on offer to the winner of the FedEx Cup series, leading 2nd-placed Justin Thomas by 340 points. World No. 2 Jordan Spieth says he will be targeting victory at the season-ending Tour Championship this week as he bids to pocket another multi-million-dollar jackpot. Spieth heads into Thursday's first round at East Lake Golf Club in pole position to claim the US$10-million bonus on offer to the winner of the FedEx Cup series, leading second-placed Justin Thomas by 340 points. That healthy points cushion means Spieth could afford to finish second in Atlanta this week and still win the title, provided none of the other players in the top five win this week's event. Mathematically, Spieth could even take the FedEx Cup title with as low as a 29th-place finish, depending on the performances of his rivals. The 24-year-old Texan, however, insists he will not be tempted into trying to play for position when the action begins on East Lake's 7,385-yard par-70 layout in Atlanta. "If you start playing for position that's when you take your foot off the gas pedal a little bit, and that's not how we normally play," Spieth said. "I'm comfortable at East Lake, and I'm in a great position." Spieth, who won the FedEx Cup two years ago, has not yet registered a victory in the playoffs this year. He would be the first player to win the title without winning a tournament if he takes the FedEx Cup this week, and only the second player after Tiger Woods to win the title twice. American Jordan Spieth tees off on the 4th hole during the first round of the BMW Championship at Conway Farms Golf Club in Lake Forest, Illinois, on September 14, 2017. Spieth finished 10 shots behind BMW Championship winner Marc Leishman on Sunday, but a final-round 65 has left the three-time major winner confident heading into the season finale. "I was pumped to have the round I did on Sunday, to gain some momentum, to maintain the No. 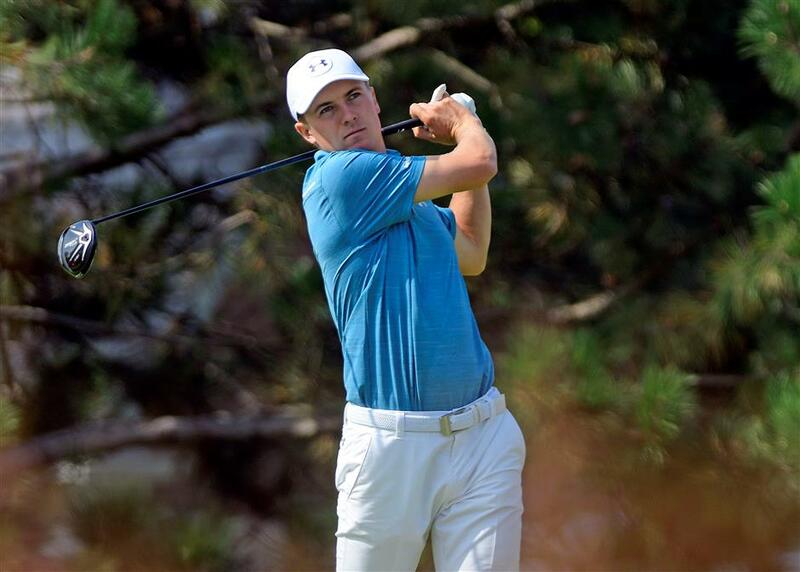 1 spot," Spieth said. "I was a little bit off at the start of the week in my striking. But I feel pretty close right now to where I was in the first two playoff events. Things feel good. If this were a major championship I'd be pretty pleased with how things are feeling on the Tuesday." Spieth said the key to a successful final event of the year has been learning to conserve energy. "In 2014 and 2016 I remember being completely worn out by the time I got to the Tour Championship," Spieth said on Tuesday. "There's a lot on the line. It's essentially a major after coming off a pretty hectic schedule in the last six or seven weeks." Spieth will partner close friend Thomas in the first round. The latter is aiming to crown a successful season with victory in Atlanta after recording five wins this year, including a maiden major title at the PGA Championship. Like Spieth, Thomas could win the FedEx Cup title with a top-three finish this week, depending on how his rivals fare. World No. 1 Dustin Johnson, meanwhile, will aim to make up for his near-miss last season, when he was pipped to the title by Rory McIlroy. Johnson won the opening leg of the FedEx Cup when he beat Spieth in a playoff at the Northern Trust in New York last month. Since then though Johnson has failed to challenge, tying for 18th at the Dell Technologies before settling for a share of 33rd at the BMW Championship last weekend.